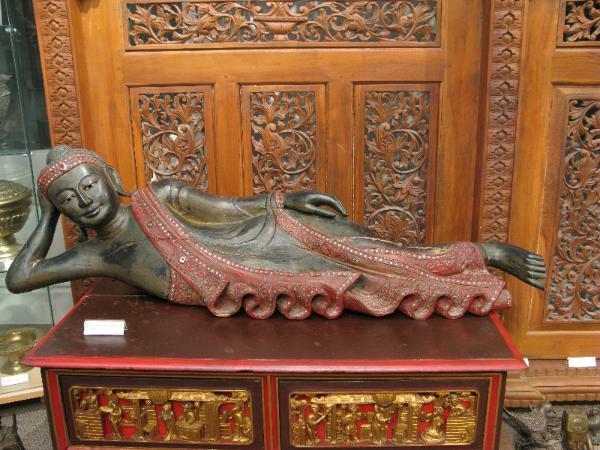 This large, reclining Buddha is from Mandalay, northern Burma (Myanmar). Carved in wood, painted and lacquered and decorated with coloured foil-backed glass chips it shows a serene, dreamily contemplative Buddha, his expression emphasised by white nacre-inlaid eyes. The fingers and toes are carved in a highly naturalistic manner; the ears are elongated and princely. The image has some losses to the lacquer-work from shrinkage but these are relatively minor given the image’s age. No restoration is evident. from a private English collection; acquired around 1880 in India/Burma and thence by descent.